Are cute and fluffy Pomsies your child's chatty new bestie?! Oh my gosh! Pinkie, Snowball and Patches might actually be the most adorable critters we’ve ever seen! 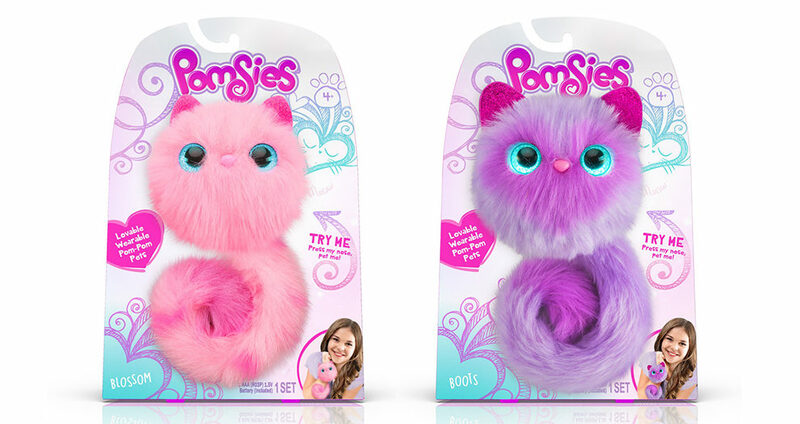 Pomsies are very, very cute fluffy interactive toys that are designed to be worn around your child’s wrist. Based on an actual pompom, the Pomsies’ eyes change colour and they respond in adorable and delightful ways when cuddled. In fact, when in Virtual Pet Mode, Pomsies have fifty different reactions and sounds. You press their noses to wake them up and then they’ll chat, purr and light up ’til the cows – or the cats – come home! The lights in their eyes work like a mood ring, with different colours indicating that the Pomsie is feeling different things. Feed them or pat them to make them feel happy, dance, play a game or a multitude of other things. Cats and koalas and unicorns, oh my! New Pomsie cat characters are imminent, with the pink-hued Blossom and lavender coloured Boots set to drop in July. Pomsie fans will be keen to collect the whole set and assemble their very own chatty family. Unicorn and koala Pomsies are apparently also on the horizon – although at the moment it seems they are exclusive to Walmart in the US. Pomsies are in store locally right now and retail for $20 a pop. Head to Big W to snap up a Pomsie or two.